FREE EVENT AT EVERGREEN LAKE! Come for a day of sustainability. Test drive an assortment of electric cars on Colorado's first EV test track. 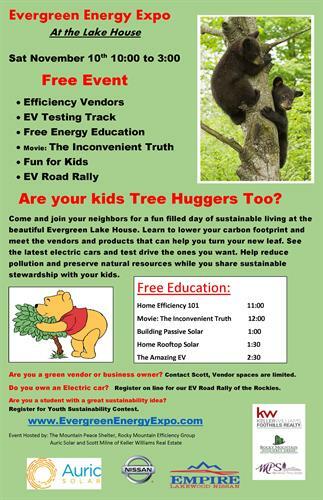 Come meet our "green" vendors and contractors or attend our free solar and efficiency education. For current homeowners, businesses, or prospective homeowners who are trying to lower their footprint, improve their buildings, and lower their utility bills. Do you own an electric car and want to participate in our road rally for prizes? Sign up today! This family-friendly event is at the Evergreen Lake House on Saturday, Nov 10th from 10am-3pm. See you there!